I'd love it if someone built an app that makes everything look like 1984. I'm not asking for what hipstamatic does. I want an app that makes everything I shoot to look like a 1984 PC game. Specifically, Kings Quest. Or Police Quest, or Space Quest. Anything pre-VGA. 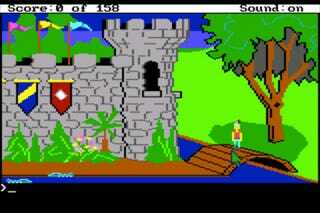 The original Kings Quest ran at a then revolutionary 16 color mode. It ran at a max of 640 by 200 on the PCJr, or 320 by 200 pixels in the Sierra's own game engine distributed for all PCs. That's it. Explaining what I want is easy! I don't quite understand why I want such a low fi thing. I guess life seems more simple at low res and color. Who can't appreciate that?